Martial Arts Pioneer, International Action Star, Grandmaster! Ron Van Clief (born January 25, 1943 in Brooklyn, New York). 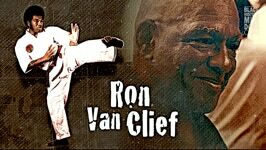 Ron Van Clief came kicking his way into history on January 25 1943 in Brooklyn New York! Even early on in Ron’s life he was always up for a challenge so in the early 1960&apos;s Ron enlisted with the United States Marines! After a tour in Vietnam in 1965 he was discharged but not before earning medals such as the national defense service medal, Marine Corps good conduct medal, and rifle sharpshooter badge! Still in his youth Ron started to take up martial arts! He studied his way from humble to student to accomplished teacher! Studying styles such as Jujutsu, Judo and Taekwondo Ron even went on to start his own Martial arts style and System blending styles he learned and giving birth to Chinese Goju System Ron would go on to earn a total of 5 black belts in his career. Studying under teachers Masters Peter Urban, Frank Ruiz, and Moses Powell! Ron even studied abroad in Hong Kong with the Legendary Bruce Lee and even earning Lees Respect with him properly nick naming him the black dragon! A fierce competitor Ron would go on to compete and win in more than 900 tournaments during forty years of international competition, retiring as an eight time U.S. Champion. And 5 time world champion This respect for the Arts with his hard work and dedication opened the door for him to get the highest honor with being inducted into the martial arts hall of fame and receiving a lifetime achievement award! It was only a matter of time until Hollywood came calling and boy they did giving Ron the chance to star in hit blaxploitation 70&apos;s films But Ron’s true Success came from over seas in Hong Kong with movies such as “The Black Dragon”, “The Black Dragon’s Revenge”, and “Way of the Black Dragon”. Ron was the Fight choreographer for the Cult Classic “Motown’s The Last Dragon”. Many close to the set and script said that it was Ron’s life that the character Bruce Leroy was based on. As the 90&apos;s rolled in Ron, never to run from a chance to compete, at the age of 51, Ron became the oldest (age 51), to compete with a start up company called the Ultimate Fighting Championship (UFC). Ron went head to head against the future UFC legend and Brazilian Jiu jitsu pioneer Royce Gracie. On a broken foot Van Clief fought like a true warrior but submitted to Gracie! Since then Ron continued to spread his teaching and martial arts expertise abroad, opening 25 schools in over 18 countries and even serving as technical advisor to the United States Secret Service! Action Star, Pioneer, and Living Legend, Ron “The Black Dragon” Van Clief. One bad dragon who&apos;s tail you don&apos;t won&apos;t to step on! All praises to Sensei Ron Van Clief. Do you want to see and read about the history makers of today? HISTORY MADE is BHMD’s fast and entertaining way to learn about people that are currently blazing the trail towards being included in the history books of the future. This is how history is made.